Due to overwhelming response, we decided to do a quick draft on the door opening ritual procedures to share with our friendly neighbours and friends..
We hope it helps you a little :) and congrats on your key collection! Optional: We did not include burning of joss sticks and incense papers. Because we are quite "liberal".. thus we mainly do it for the peace of mind! Choose a good date/time for first time door opening. Just key in your key collection date on the left..
Make sure Zodiac never clash.. This is what we brought..
1 huat kuey (brown, yellow or orange) DO NOT PUT WHITE! A dish with wet cotton wool, water with green beans for germinating, let it grow into bean sprouts, this process symbolic "growth" and have some "yang qi" at home. Note: For fruits you can decide on your own, preferably buy 5 or in a bunch. Note: you may refer to your own floor plan to see where is the 4 corners. For us the 2 corners is the master bedroom, another 2 corners is in the living room (1 behind the door, another one near the window). Note: Can place in the middle of the kitchen if you are unsure where is the gas outlet. Go ahead to check defects..walk around the house..
Before you leave the house, you can bring the fruits in the living room back.. except the pineapple (leave it there), the rest you may leave it in the house (the oranges at the 4 corners do not bring back too). Do not sweep/enter the house for 3 days after placement (count 3 days excluding the day you perform the "ritual") After 3 days, clear everything and use the red packet $ to buy sweets or sweet drinks for own or family consumption. Try to perform the ritual with your partner alone, or with immediate family members, do not include outsiders. Ensure no one's zodiac clash! Money in the red packet use to buy sweets or sweet drinks for family consumption, can buy ice cream too, as long as it is to buy something sweet "甜甜蜜蜜"
If green beans does not sprout, place it at somewhere with light, even after three days you can still add water, make sure it grows. After one week, you may throw it away. Bring a door stopper if you want.. if not the door will auto close, no wind. Do share this post and help more people! <3 Spread the love! Nice one lah! We also liberal, but cannot don't do anything. Will follow what you do! Thanks sweet couple! May I check why no pears allowed? Thank you for your feature Bigtreeandkoala. Pears not allow because of it's colour.. Usually green, pale white, or yellowish. You will need to get more auspicious colour fruits like the ones mentioned above. Pear in chinese read as "Li" meaning separation. Cool! Thanks for the helpful information! Will follow ur procedure.. It is very useful for us. Thanks Sabrina for your kind sharing. Hi do you know if preggie allow to do the ceremony? Cos im currently pregnant not sure if we should go collect the keys.. Thanks for sharing. We'll be getting our keys very soon and this will be a great help. Then how about the pineapple after 3 days? What to do with it. Thanks for the informative post once again! You both rocks! Stay lovely and see you both around Sengkang! Very outstanding couple! May I know how to see which is the corners of the room to place the oranges? Thanks so much! Sweetest couple ever! I hear many version, yours still the best! Thanks for sharing! Followed you on Instagram, have fun in Australia babe! Hello! May I ask if the items must be left there for at least 3 days? Any repercussions if less than that? Hi! There are total $48 $1 coins are we supposed to use all $48 to buy sweet stuffs? And must it be paid with the $1 coins only? But really dun know why you chosen BT&K for yours, care to share? Well, after coming across your blog on the door opening ritual, we're impressed and wow, knowing nuts about how to go about, we find this information really awesome, useful and there is kind soul out there care enough to share. Hi! This info is extremely useful! May i know why must i leave the oranges there for 3 days? Is it ok i take away? why cannot go back to the house for 3 days ? Hi! May i know the $1 coins does it have to be old $1 coins or new coins also can? 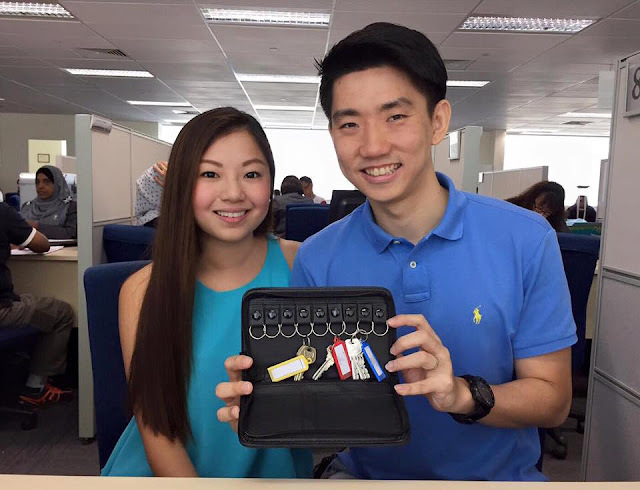 For the past few months, I have been searching and searching, and researching for ideas, information and procedures on what to do when me and my wife get my new HDB BTO house keys. This is the first time, I am getting a new BTO house keys from HDB. Finally, the day has come. I will be proceeding to HDB Hub on 24th November 2016, Thursday morning to collect my new HDB house keys. My new house will be at Bendemeer Light, Bendemeer Road. I am Christian, therefore, I will not be burning of joss sticks and incense papers. Yes, I am also Liberal. As I have lived in America, U.S.A. in the past, therefore, I know what liberal is like. I am mainly doing it for the Peace Of Mind! Thank you for your ideas, very details. It was very useful and informative ! Hi! Thanks for the infor. Can I check if it is required to throw the rice mixture in store room also? how about the 4 corners of the house if say, the store is located near to the entrance or is part of the living room? Hi, may i know, if i open the door before 7th month, and after 7th month finishes, do i need to perform again another same ritual? And, for the 4 corners, if my bomb shelter is located in living room, do consider 1 of the corner inside the bomb shelter? Hi, may i know, if i open the door before 7th month and perform the ritual and clean after 3 days, do i still need to perform another same ritual after the 7th month before I start the renovation construction? Hi there! Just wanted to thank you for sharing this! It's been most helpful when we did our opening ceremony last week. Appreciate it! Thanks for sharing this very informative subject. BTW, I would appreciate if you could post what are the "rituals" before starting to do renovation works. GOD blessed you both.